We’re living in a pretty exciting period where robots have become ever more present in our “human lives”. They aren’t simply watched in Sci-Fi films on our living room screens anymore, but like the BB8 they are rolling around our homes (!) transforming our videos into holograms. As the world we live in gets smarter, we all expect new devices that will change our lives….and smart robots are first in line to deliver these differences! They can transform the way we work to be more productive, assist in our personal life with household chores and even help the ageing population through greater independence. The potential of smart robotics is huge! Though to get there they have to be up-to-date with what is and isn’t working in our society and understand what we are using in our daily lives so they can bring about these transformations. They need a smart ecosystem. One that’s relevant, up-to-date with user experiences…something like an app store. Robots powered by apps hold a longer life span as they rely on software updates which maintain their relevance. Think about a robot that’s controlled via a social network. If this network loses popularity after a few years and a new one takes the crown – not an unlikely situation – a robot connected to an app store can get a software upgrade or a new app downloaded which will give it a new life. Robots without apps just do not have a future with consumers always demanding a more relevant, more affordable option. Robot App stores probably hold the most important roles in the future of robotics, as this is where the industry’s greatest potential lies. It’s still far away from the popularity of phone apps but as the robotics industry grows and more developers participate, be it professionals, students or hobbyists, this will inevitably change. We’re excited to be a part of this change and can’t wait to showcase some of these app powered robots at Mobile World Congress (MWC) this year. 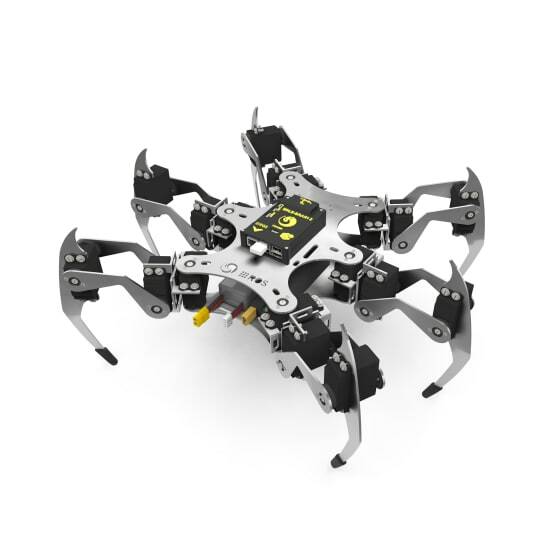 Erle Spider, is an Ubuntu drone with legs! It’s powered by ROS, the programming language for Robots, and has a couple apps that make him a very special robot indeed. The spider can be remotely controlled via a Twitter app and whatever the robot sees can also be streamed on YouTube via its app! The same makers, Erle, launched its first flying drone with apps at the back of a successful crowdfunding campaign in 2015 which we’ll also be showcasing. Drones are the fastest growing market in the robotics space, particularly led by commercial drone adoption. The Erle Drone powered by Ubuntu Core can easily be extended through a number of apps including the Youtube streaming app and the Altitude Angel app that prevents drones from going into no-fly zones. And there’s UAVIA, which is the only drone in the world to be entirely remotely piloted via a 4G connection. This is an interim step between a fully autonomous and locally piloted drone which means venues could have a drone in residence which would land in a nest to get recharged after each flight. Drones and Robotics are an exploding market! And for those of you heading to MWC we’d love to discuss this topic more. For more info on our MWC demos see here.